Sean Szymkowski April 23, 2018 Comment Now! 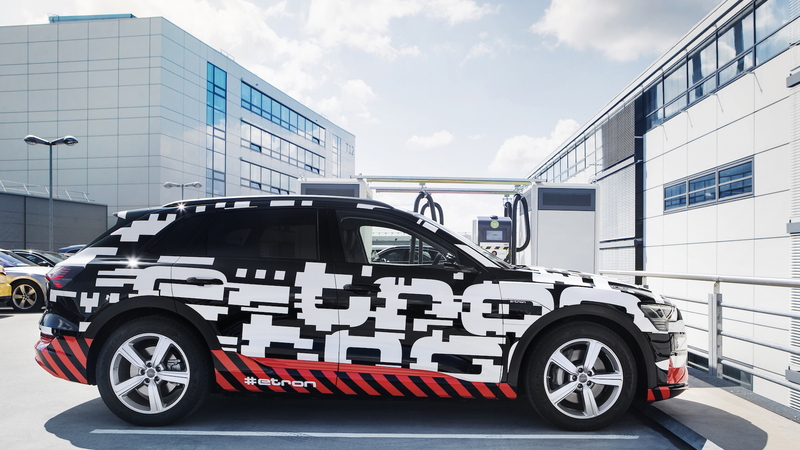 Audi's upcoming e-tron electric SUV will have a slick feature up its sleeve when it hits European roads: the battery will be able to charge more quickly than today’s Tesla hatchbacks on their dedicated Supercharger network. The keys to its rapid refueling are a dense, powerful battery pack and a new high-speed charging infrastructure. The battery pack bundles 432 pouch-type cells, 12 to a module, inside a sandwich of aluminum panels. Roughly the size of a queen bed, the battery pack bolts to the car’s structure at 35 points, which also makes it part of the structure itself. Beneath that layer, Audi runs water and anti-freeze through a cooling circuit that’s glued with thermally responsive adhesive to the battery layer. With a heat exchanger mounted near the front left corner, the e-tron battery pack can keep its temperature between 77 and 95 degrees when plugged in or when on the go--and that helps preserve its battery’s ability to be charged quickly and repeatedly. 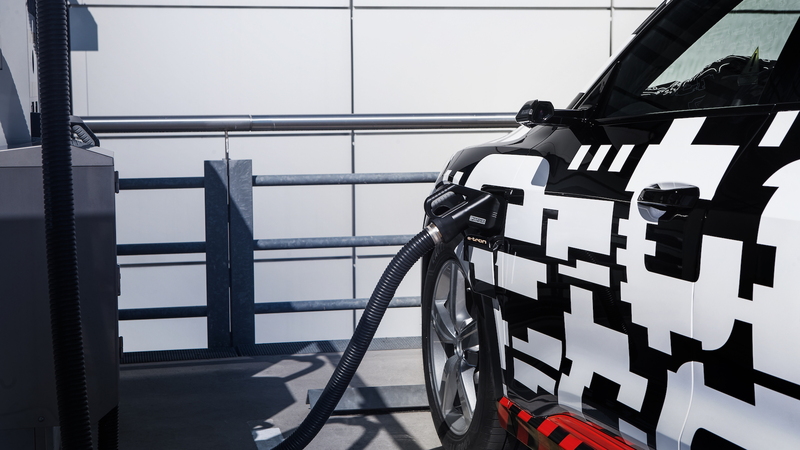 Audi says the e-tron will be the first production vehicle that can be charged on a 150-kilowatt DC line, under the Combined Charging System (CCS) standard. That high-speed will replenish the e-tron's 95-kilowatt-hour lithium-ion battery pack to 80 percent in 30 minutes. On European cycles, the e-tron battery is rated at 248.5 miles of range. Audi will not have EPA range ratings until later this year. 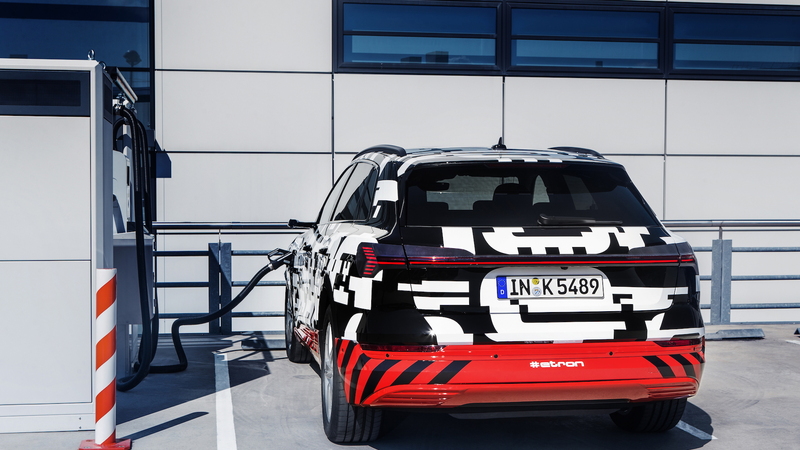 The 2019 e-tron’s battery pack will be able to connect through either one or two on-board chargers to replenish its stores from a wide range of stations and charge points. 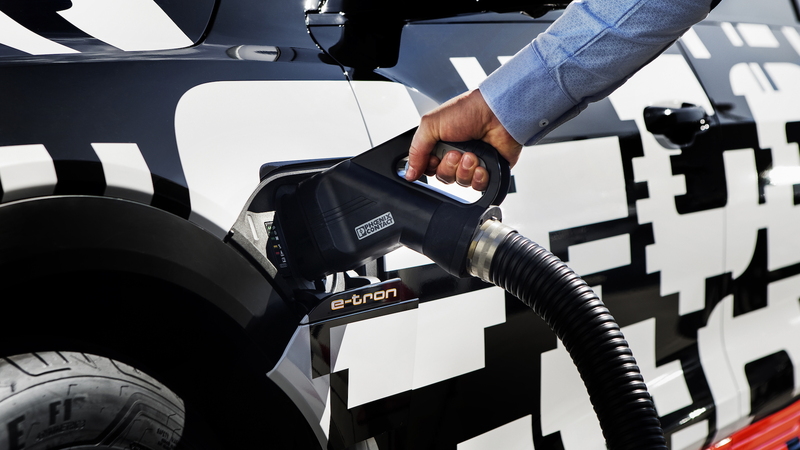 In Europe, e-tron charging will be possible at most of the more than 65,000 charge points now available across the continent. The key to high-speed charging will be the forthcoming Ionity network of charging stations now under construction across Europe. Ionity is a consortium that includes a handful of automakers, including Audi, and Shell. Ionity plans to build 200 fast-charging stations by the end of 2018, with roughly six fast chargers at each station. By 2020, Ionity plans 400 locations set at 75-mile intervals along highways and main roads. Some stations will also crop up at Shell fueling stations. If a fast charger isn't in the area, owners will be able to use 11-kw AC chargers, or optionally, a 22-kw charger, both portable. 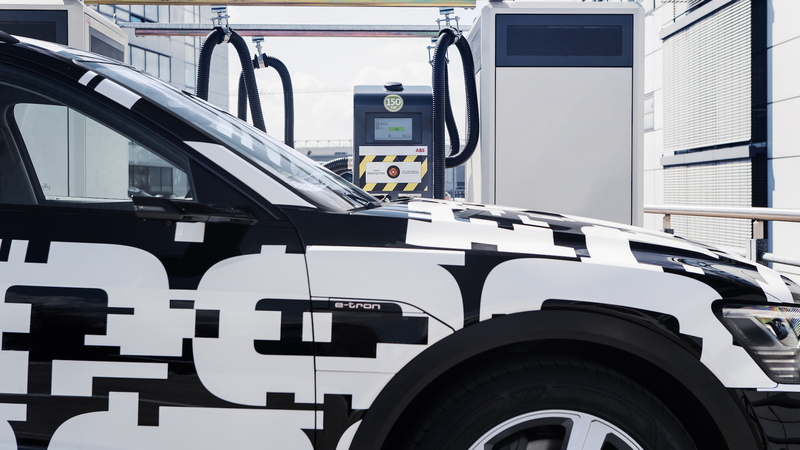 To the delight of electric-vehicle owners, Audi plans to dole out a card that will handle the “paperwork” of charging at any of the thousands of available charging stations across Europe. Billing is automatic after signing up one time with the myAudi portal. Next year, Audi will roll out a seamless Plug & Charge feature. The system will automatically authorize the e-tron and unlock the charging station for use. In the U.S., the budding Electrify America network–funded in part by VW Group’s $2 billion Dieselgate settlement–will build nearly 300 high-speed chargers across the country by the end of next year, some at retail outlets such as Walmart and Target. The e-tron should debut in Europe later this year with a U.S. launch following closely in early 2019. Audi promises 10 battery-electric cars will join its lineup in the next seven years, with body styles that will range from a compact hatchback to full-size luxury sedan.